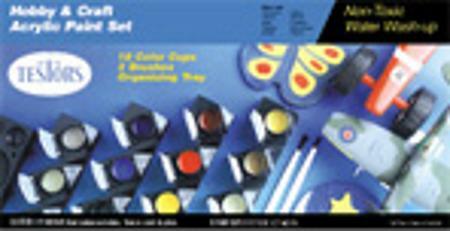 This is a Testors Hobby and Craft Acrylic Paint Set. Retail $10.96 SAVE 30% ! Save box for paint color reference. Colors are arranged in the containers as they appear in box photo. Pictured craft items not included with kit. Product specification subject to change without notice. I was very pleased with the paints, they allowed me to create the paint color schem that I was looking for with my Northsea Fishing Trawler. Eighteen acrylic paint cups, stored in a convenient mixing tray. Paint colors are featured on the top and back of box packaging. For use on: ceramic, stone, wax, plastic, metal, glass, wood, leather, styrofoam and paper. Paint is certified non-toxic and washes up with water. Good quality paint set used it to paint figures on model railroad set. "this paint is for kids"